The Japanese legend of O-Tei illustrates the haunting appeal of the idea of reincarnation. O-Tei was a young girl engaged to be married. She fell ill, and as she lay dying she promised her future husband that she would come back in a healthier body. She died, and the young man wrote a promise to marry her if she ever returned. Reincarnation plays a central role in Hinduism. People who have performed good deeds and led moral lives are reborn into higher social classes; those who have failed in these areas are doomed to return as members of the lower classes or as animals. 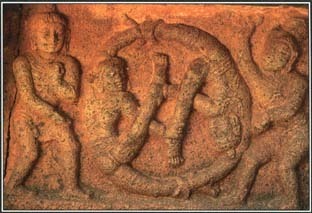 This carving of two men with a wheel represents the cycle of birth and rebirth. Time passed, and eventually he married another woman and had a child. But his wife and child also died. Hoping to heal his grief, the man went on a journey. In a village he had never visited, he stayed in an inn where a girl who looked much like O-Tei waited on him. He asked her name and, speaking in the voice of his first love, she told him that it was O-Tei. She said that she knew of his promise and had returned to him. Then she fainted. When the girl awoke, she had no memory of her former life or what she had said to the man. The two were married and lived happily together. See also Afterlife ; Australian Mythology ; Buddhism and Mythology ; Hinduism and Mythology .